The Office of Cancer Complementary and Alternative Medicine, DCTD, initiated the first NIH-sponsored, comprehensive meeting on microbial-based cancer therapy, which convened on July 11-12, 2017. A trans-NCI working group consisting of staff from DCTD, the Division of Cancer Biology, the Division of Cancer Prevention, and the NCI Small Business Innovation Research program planned and supported this important meeting. While microbial-based cancer therapy dates from the late 19th century, this potentially promising research area remains understudied. Recent scientific advances in tumor biology, microbial pathogenesis, cancer immunity, and new molecular tools have made it possible to revisit this old concept from new perspectives. The goals of NCI’s multidisciplinary conference were to provide a forum for the nearly 300 participants from academia, industry, and the federal government to learn about these recent advances in the field and to develop new scientific collaborations, interactions, and research programs. The conference included 19 speakers in sessions on the biology of microbe-tumor interactions, virus- and bacteria-based therapies, translational aspects of microbial-based therapies, and a poster session. 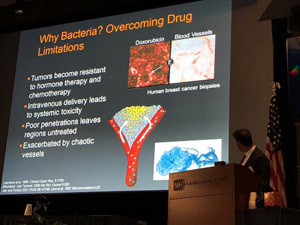 Opportunities for microbial-based therapy where conventional therapy is inadequate were highlighted, such as tumor cell dormancy, tumor cells that are not well affected by drugs, hypoxia, or poorly vascularized tumors. 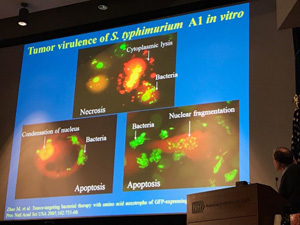 In addition, speakers described the complex nature of the microbe-tumor interaction and discussed recent advances in the field. Future research could involve studying the unique potential of viruses and bacteria to invade, damage, or destroy human cells and induce immune responses to create new, safe, and effective therapeutic approaches. Post-meeting activities include preparation of a white paper by a Working Group, and a possible journal special issue aimed to highlight the clinical potential of microbial-based cancer therapy. Read the workshop report published in Cancer Immunology Research.